Car free Wengen (1274m), is a truly unique and wonderful village that sits on a sunny balcony in the mountain side among some of the planet/?/s most spectacular mountain scenery. Purpose built more than a century ago it is made up mostly of large Victorian-era hotels and has a built a reputation for quality in service and cuisine. Situated in the Jungfrau region it is a large resort with 23 lifts (inc 10 chair lifts, 4 surface lifts, 3 trains , 1 gondola and 1 cable car) that offers skiers 4777 feet of vertical descent. 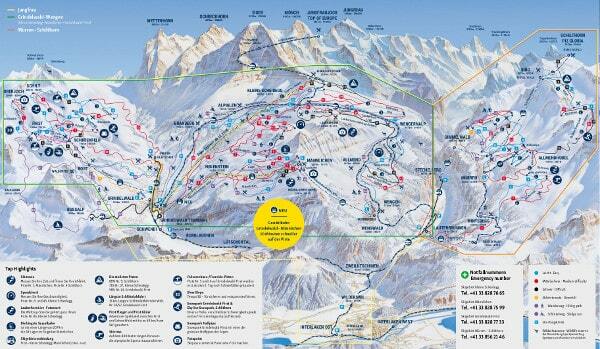 Wengen has 112kms (213lm in region) of terrain over 53 pistes. A large proportion of the pistes (55%) at Wengen are covered by snowmaking. Wengen has an excellent beginners area in the village. The area is best suited to intermediate skiers and snowboarders but there is some terrain for advanced skiers including extensive off piste. There are no cross country ski tracks in Wengen but there are 40kms in the region together with 100kms of winter hiking paths and 50kms of sledge runs. For snowboarders and free style skiers there is a small terrain park. Wengen rates high for alpine charm and the awesome scenery of the Eiger, Monch and Jungfrau massif. The nearest airport is at Bern and the nearest train station is in Wengen. There is accommodation located close to the pistes in hotels and chalet appartments.